And Dodd has a Lamont button on. WooHoo! 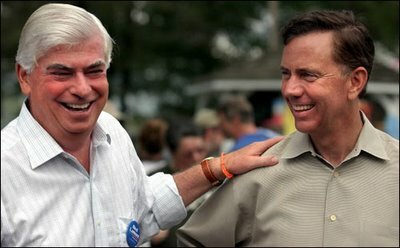 It looks like prominent Connecticut politicians are finally recovering from their nasty, prolonged bout of Liebermanitis. I wish them well with their new-found health, and hope that they will now start to act in America's best interests. We should reward Chris for this by getting behind his 2008 ambitions. What a fantastic, Democratic picture.